So today we’re going to zero in on four CEFs whose massive dividends (up to 12.7%!) might tempt you to buy. But doing so will lock you into an ever-shrinking income stream while the share price crumbles beneath your feet. The first red flag? All four of these funds are from Wells Fargo (WFC), a bank that’s been at the center of various scandals for years now, starting with the 2016 fake-account fraud that took down Wells’ CEO at the time. Don’t be surprised if you haven’t heard that Wells offers CEFs; it does so through its tiny Wells Fargo Asset Management business. Its CEFs are the Wells Fargo Income Opportunities Fund (EAD), the Wells Fargo Multi-Sector Income Fund (ERC), the Wells Fargo Utilities & High Income Fund (ERH) and the Wells Fargo Global Dividend Opportunity Fund (EOD). Don’t be tempted—because these seemingly attractive payouts are warning signs. Since the recession, all of these funds’ payouts have fallen, with only ERC’s dividend (in orange) showing any signs of not going down the tubes. But if you’re thinking of buying ERC for its 10.9% income stream, don’t bother. One of the reasons I like some CEFs is that they’ve crushed the “dumb” index funds over a long period. ERC, however, is not one of these stout performers. 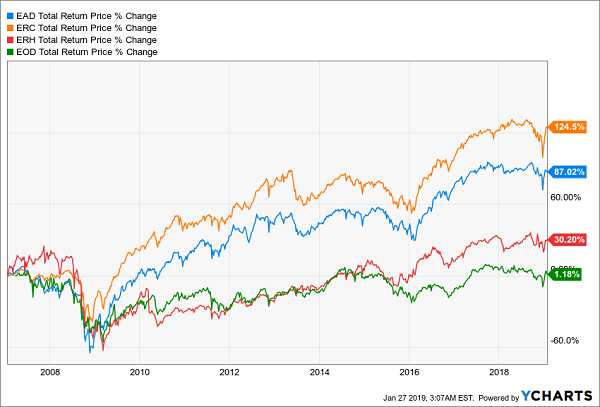 Since inception, ERC has returned slightly more than half of what the SPDR S&P 500 ETF (SPY), a low-cost index fund that simply tracks the S&P 500, would have given you. And ERC has underperformed almost all of its CEF peers in this time. And this is the best CEF Wells can offer! As you can see, not one of Wells Fargo’s funds has managed to beat the fund that couldn’t match the S&P 500. And EOD just recently went from a loss to a measly 1.2% return in total over the last decade! Such obscene underperformance doesn’t deserve anyone’s money. And it definitely doesn’t deserve any fees. All of Wells Fargo’s CEFs charge fees, of course, but the scandalous thing is how high those fees are, particularly compared to SPY (which outperformed all of them, let’s remember). 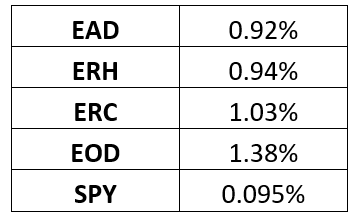 At the cheapest, EAD’s fees are 9.7 times higher than those of SPY, while EOD’s are over 14 times higher. 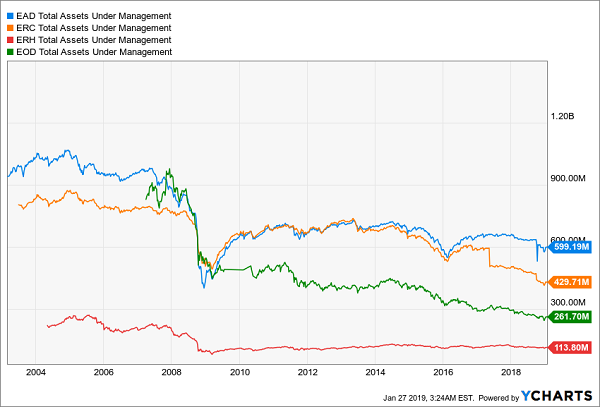 I’m not averse to paying higher fees if they mean better performance—but not only do these funds lag SPY, they lag many other funds that invest in the same type of assets. With that in mind, you should avoid these funds for another reason: as they shrink, Wells Fargo will have less motivation to properly oversee them, and you only have to look at the headlines to see what can happen when the bank takes its eye off the ball. The $1 billion EAD once had has shrunk to less than $600 million, with no end in sight, while all of Wells Fargo’s other CEFs continue to shrink. As these funds become a smaller part of Wells Fargo, whose net income was over $20 billion for 2018, the bank could wind end up shutting them down—only after their value and income streams have further melted away. I don’t know about you, but I’m sick of big Wall Street names like Wells locking in billions in profits while offering us subpar investments like these four funds. It’s an outrage! Especially when you consider that Wells could easily afford to hire top talent to run these CEFs and deliver a proper return to their investors. The worst part is that dud funds like these mask the fact that there are many amazing CEFs out there throwing off safe 8%+ cash dividends. Better yet, many of these top-quality funds are trading at incredible discounts right now, thanks to the recent selloff. But you won’t hear from them from your advisor—and especially not from big banks like Wells, which are 100% focused on selling their own products, which all too often are unacceptable funds like the ones I just showed you. 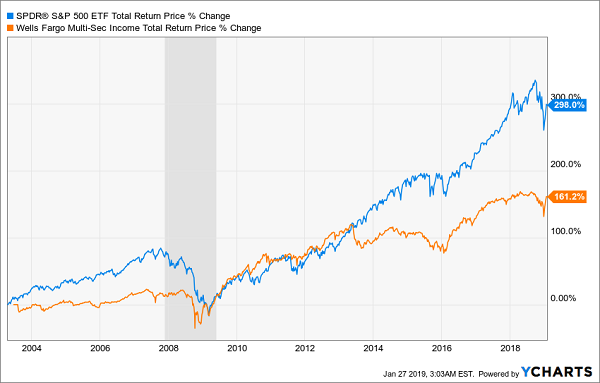 This is exactly why I launched my CEF Insider service, to help everyday investors like you tap the 20%+ yearly price upside and SAFE 8%+ dividends that are readily available in CEFs—if you know where to look. A fund that soared 1,250% since inception and pays an incredible 8.1% today. Even so, it’s dirt cheap now … and ready for its next ride up. 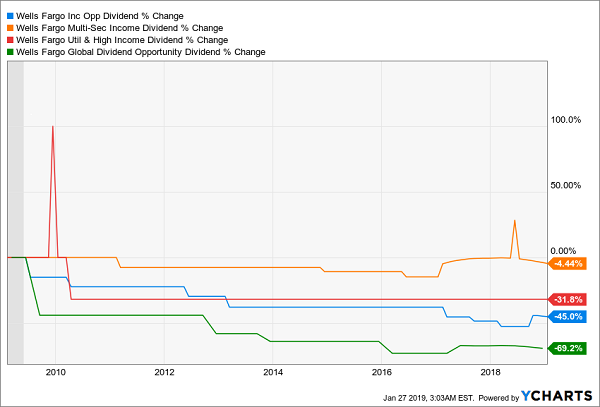 The special-dividend machine: This 9% payer throws off one-time cash payouts every year … and every year this takes the herd by surprise (even though it shouldn’t), driving incredible price gains. The fund that DOUBLED the market in the last decade and pays a safe 8.4% dividend now. The CEF that just dropped a mammoth 49% dividend hike on investors—and is set to drop another massive increase this year too! A retirement cornerstone: This CEF holds floating-rate loans, which ratchet higher when rates rise and will keep on throw off a huge income stream when they hold steady. This smartly run fund takes that cash—from some of America’s strongest companies—and hands it to you as a gaudy 8.4% dividend! Now I’m ready to GIVE you this exclusive Special Report free. Simply click here to grab your copy and discover these 5 CEFs’ names, tickers, best-buy prices and everything I have on each one.